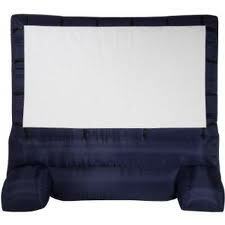 The 12' Inflatable Movie Screen Rental is great for your backyard movie party. Whether its watching a movie, the big game or the kids playing their favorite video game. We provide the projector and speakers, you provide the DVD player, cable box or video game system. Complete your movie rental night by adding on the popcorn machine. Must be used at night.